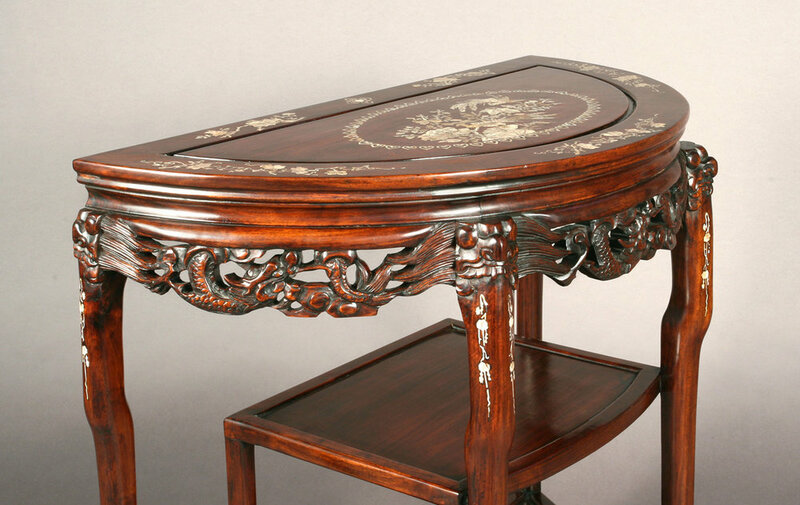 This elegant rosewood table with mother-of-pearl inlay exemplifies traditional Chinese design. For centuries, solid rosewood furniture has been treasured both in exquisite homes in China and around the world for its distinct aesthetic style and durability. The properties of Hongmu Rosewood (meaning red wood in Chinese), are similar to those of ebony and other finest hardwoods. The wood is finely grained and denser than water, (it would not float but sink in water), and it is high in oils and resins. These properties of material make furniture structurally stable, hard wearing, and fairly resistant to warping or cracking in tropical conditions due to expansion and contraction. The density and strength of rosewood allow oriental furniture to be built without the use of glue and nails, but rather being constructed using joinery and doweling alone. Despite being constructed from solid wood, Chinese furniture usually retains a light and airy appearance. The shapes can be simple but can be carved and processed ornately resulting in elaborate magnificent open work detail full of symbolic shapes and figures. This table is abundantly decorated with open carvings of dragons adorning the entire apron edge. Dragons are often represented in Chinese art to symbolize power and authority. The shelves installed beneath the table top are made of thin panels and provide additional stability to the piece by connecting legs on the sides, and providing attachment point to the two back legs. The top features delicate mother-of-pearl designs contrasting with dark rosewood support. The center inlaid scene details floral bushes, leaves of various shapes, branches, all of which highlight the focal point — two peacocks. Along the perimeter, there are beautiful renditions of cascading vines and flowers. Elegant inlay continues throughout the top sections of the legs. Intricate detailing etched within the mother-of-pearl inlay bring additional depth to the design. The table sustained impact damage with related structural damage. The center shelf was completely detached at both front and back dowel joints where it connected with the front legs and back supports. There was recent loss to the rosewood evident on both front dowel joints. The front edge of the table top had two splits in the wood that measured 2" in length, adjacent to the joints above each of the front legs. 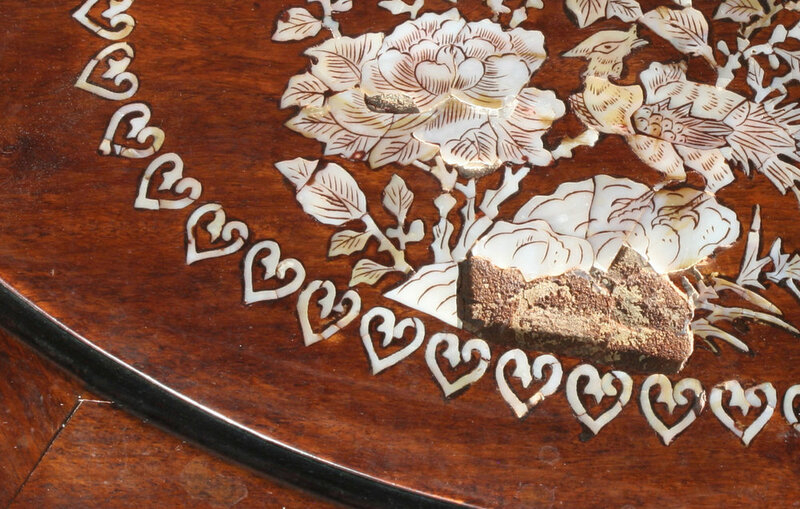 There were scattered areas of delaminating and lifting mother-of-pearl on the table top, and among them one large loss of mother of pearl inlay at the center (2.75" x 1.25"). There was evidence of previous repairs to the mother of pearl inlay that had discolored over time. The center shelf and supports were carefully removed and fit with new dowels. The wood losses around the joints were infilled. The two splits on the front edge of the table top were stabilized. The areas of missing mother of pearl inlay were meticulously recreated by a conservator who sourced a comparable species in grain and tone. The sourced mother of pearl was then hand cut to match the existing silhouette shape in the substrate wood where the inlays were missing. The replaced inlay was then engraved and detailed by hand to integrate with the existing design. Every delicate inlaid piece was assessed and consolidated to help ensure the piece’s stability while on display. The surface of the entire table was cleaned. The scratches were addressed, and discolored finish was restored while retaining its beautiful patina. A protective coat of microcrystalline wax was applied, and hand buffed to a uniform sheen. If you have any questions, please feel welcome to contact us at 312-243-5669, info@bernackiconservation.com﻿.